A new law updating the state’s Graduated Driver’s Licensing (GDL) law for young drivers will take effect on Tuesday, Dec. 27. That means changes for existing junior drivers and permit holders, as well as teens who obtain their permits after the 27th. The law requires everyone under the age of 18 in a vehicle to be properly buckled up, whether in a seat belt or a child safety or booster seat. By making the failure to do so a primary offense, a law enforcement officer may pull over a driver if the officer sees that someone under age 18 is not securely fastened. The law also increases the required number of hours of behind-the-wheel training for permit holders from 50 to 65. Ten of those hours must be at night and five logged during inclement weather. This applies to teens who do not yet have their permits or have their permits but have not yet passed the on-the-road driving skills test. If you have your permit and have already passed that test, you are required to have just 50 hours of behind-the-wheel training, though the additional hours might be helpful to you. The third component of the law sets restrictions for the number of passengers in a vehicle driven by a teen. In the first six months of being licensed, a teen can only carry one, non-family passenger who is younger than 18. After the first six months and until the junior driver turns 18, a limit of three non-family passengers under age 18 is permitted. If a junior driver has been involved in a reportable accident for which the junior driver is partially or fully responsible in the Pennsylvania Department of Transportation’s opinion, the one-person passenger limit will apply until age 18. While we continue to work to preserve federal funding for bicycling and walking, there is an opportunity this week to ensure that federally funded transportation projects accommodate the needs and safety of all users — including pedestrians and bicyclists. This would be a real chance to see Complete Streets policies enacted in every state. On Wednesday morning, the U.S. Senate Committee on Commerce, Science, and Transportation will consider an amendment offered by Alaska Senator Mark Begich to provide safe and adequate accommodations for all users in all federally funded street projects. This means safer roads for everyone, including those who walk, bicycle, ride transit, or drive cars. Please forward this message to all of your members and supporters, with a link to the League of American Bicyclists’ Action Center, where you can send an email directly to your Senator. Below, you’ll find a sample letter you can customize to send to your Senator, as well. Attached, you’ll find additional talking points and information about the amendment. This is the first time in more than six years that our federal representatives will take a vote on Complete Streets language — please, take action TODAY! Nat'l Safe Routes to School State Network Report RELEASED TODAY! In the winter of 2009, a board member of WalkBikeBerks rallied a large, diverse coalition of stakeholders across Pennsylvania to collaboratively write ands submit a grant application to build the Pennsylvania Safe Routes To School State Network Project. The application was accepted, and with the leadership of Pennsylvania Walks & Bikes, the PA SRTS State Network Project launched in January of 2010. Now, you can read the final report of those efforts, combined with the efforts of the other state networks across the nation. The Safe Routes to School National Partnership’s state network project brings together state leaders to remove barriers to walking and bicycling to and from school. We write to share with you the National Partnership’s 2010-2011 report, entitled: Safe Routes to School State Network Project Final Report, 2010-2011: Phase II - Successes and Lessons Learned, which includes policy successes, lessons learned and local success stories that were a result of policy changes led by the 20 state network coalitions. Key policy wins from each of the 19 network states and the District of Columbia included improvements to state Safe Routes to School programs that increased award and obligation rates for local community grant recipients and lower-income communities, policies creating street-scale improvements for walking and bicycling, school siting and joint use agreements, supporting lower-income communities and improving personal safety. State networks influenced the distribution of more than $100 million in Safe Routes to School funds. This report was written by the Safe Routes to School National Partnership, a national network of more than 550 organizations. The report was funded by the Robert Wood Johnson Foundation, the nation’s largest health foundation. Originally launched in 2007 in 10 states, the project supported networks during 2010 and 2011 in California, Colorado, District of Columbia, Florida, Georgia, Hawaii, Illinois, Kentucky, Louisiana, Maryland, Michigan, Minnesota, Mississippi, Missouri, Montana, Oklahoma, Pennsylvania*, Tennessee, Virginia and Wisconsin. Collectively, the 20 state networks engaged more than 900 partner organizations and agencies as active participants in improving the built environment and increasing physical activity for children, with a focus on serving lower-income communities. The networks each made substantial improvements to transportation policies and funding allocations, safety, land use, the environment and public health. In some states, networks were the first statewide group to address particular policy issues. Every Body Walk! Launches New App! Every Body Walk! is committed to get Americans up and moving. The Every Body Walk! app enables you to personalize your walking plan, connect with walking communities, learn about the latest fitness trends and tips and more. Get connected and get walking! Track and save your own walking routes, build your walking history--then share your progress on Facebook! Discover walking groups and walking paths near you with an interactive map! Read the latest news about walking, health news, trends and more! Watch videos that include walking tips, how communities are embracing walking, advice from experts and more! That brings the riding season to close. Which should be speeding down the boulevard. Which crowds the rumbling street cars to the door? But keeps on riding as it did before? No cable breaks, no lumbering teams delay. Are but a vain delusion and a snare. Until it lies at least five inches deep. Pennsylvania is on the brink of joining ranks with those 18 states and there is now an opportunity for you to take action to urge passage of a state-wide safe passing bill. It will be legal for a driver to pass a bicyclist when it is safe to do so by crossing over a double line. Since 2008, WalkBikeBerks has been committed to improving walking and bicycling in Berks County. With the support of community members like yourself, we have achieved a number of accomplishments. I've listed some of those achievements on the left bar of this letter. This year we are especially proud of the fact thatyour financial gifts and volunteer efforts helped more schools and parents celebrate International Walk to School Day on October 5 than ever before. We look forward to sharing an even more successful 2012 with you. In order for WalkBikeBerks to continue our successes and to continue our work for you, we need your support. 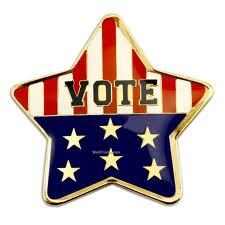 Please consider making a donation or become a member for $35.00. By doing so, you will be helping us make walking and biking practical, convenient, and safe in Berks County. Click Here to make a donation and become a member. Put down your cell phone! The Governor has made our streets a little safer today! This past Tuesday, Nov. 1, the U.S. Senate voted 60-38 against Senate Amendment 821. The amendment, introduced by Senator Rand Paul (Ky.) and which we notified you about late last week, would have eliminated the Transportation Enhancements (TE) program—the nation's largest funding source for trails, walking and bicycling. The bipartisan vote signals, yet again, the tremendous support for TE in communities of all shapes and sizes around the country. For more on the amendment and the vote, please see Rails-to-Trails Conservancy's "Breaking News" story on this victory. ALERT: Walking and Bicycling Safety are under attack! is once again on the chopping block. Senator Rand Paul has seized upon the very serious T4 America reports examining the woeful condition of our country’s bridges to force Americans to make an unnecessary choice: safety in our cars while crossing bridges or safety while walking or biking in our communities. Tell your Senators that we don’t have to choose. Protect bike and pedestrian funding against this misguided attack. Senator Paul’s amendment would also change the TIGER program — competitive grants awarded to all kinds of transportation projects — so that projects to make walking or biking safer won’t be eligible. The amendment would also redirect a relatively small amount of funding — 10 percent of the TIGER program — into bridge repair. At the cost of safety for everyone who uses a road, states would gain enough money to repaint a few bridges. States can already take up to half of their money for bridge repair and spend it on new highway capacity, no matter the condition of their bridges. And states can already spend most of what’s usually the biggest pot of transportation funding on almost anything they want. They could fix bridges, build transit, highways, bridges, sidewalks; it's all eligible, and totally up to the states. No mandates from Washington. This amendment will be offered on the floor of the Senate tomorrow (Tuesday). Write or call your Senators and tell them that this proposal will do almost nothing to fix our bridges while making us less safe. Thank you again for stepping forward to help. Exciting new research. Please read this Forbes article (link below) that points to a new AAA Foundation study on Vehicle Speed and a Pedestrian’s Risk of Severe Injury or Death. This study updates the well-known research from Great Britain and quantifies the increased vulnerability of older pedestrians. The best part, the AAA Foundation calls for traffic calming in urban areas. RESCHEDULED FOR TODAY AT 9AM. WalkBikeBerks is hosting a League of American Bicyclists Youth skills class on Saturday, September 24 from 9 AM to 11 PM. This is a 2 hour class for youth up to age 13 where they will receive specific, individual attention from our L.A.B. certified bicycle instructor Benton Levengood with assistance from WalkBikeBerks members. 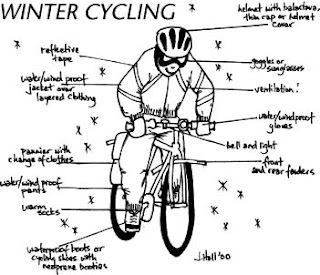 Topics covered include how to perform a bicycle safety check, helmet fitting and bike sizing. To register for this course, email a parent and child's full names, phone number and child's age to: info@walkbikeberks.org. Class size is limited so please register early. We are able to provide some participants free helmets due to the generosity of AAA Reading-Berks. Limited sizes available to children who need a helmet. Death diminishes and challenges us all, no matter what the circumstances. As we observe the 10th Anniversary of 9/11, memorial services are held in communities of all sizes across our country. Even some NFL players wear specially designed gear in support of families who experienced the loss of a loved one on that day, or in the ensuing conflicts that have been fought in Afghanistan, and Iraq. Thousands have died, and whether each of us personally new these victims, we along with their families are diminished due to the loss of the love and service they would have continued to share with family, friends, and others in need throughout our world. I am reminded, too, that over 350,000 loved ones have died during the past 10 years on our nations roadways. Their family and friends also grieve the loss of love, friendship, and service that their children, siblings, parents, cousins, friends undoubtedly would have shared had they lived. How are all the deaths of these loved ones connected? Quite simply, the death of anyone we care for, and who cared for us, is never easy, and we are all diminished by what might have been had they lived - through the tragedies of the Twin Towers, Shanksville, and the Pentagon, to the battlefields of the Middle East, to the death of a child at the hands of a speeding, texting, or stop-sign running driver. We imagine a high school graduation, a wedding, a future grandchild, a hug, an "I love you," a hike in the mountains together, sharing holidays and birthdays, and so much more. We often grieve for the possibilities of the future, for what could have been. Within our sorrow, we are left not only with memories, but also of the challenge of new possibilities - of what we each can do to create a legacy in remembering all the life and love a daughter, son, brother, sister, mother, father, friend has shared with us. Over the 13 years that I have worked to grow Keep Kids Alive Drive 25, I have encountered families who, like many of the survivors of the tragedies of 9/11, work to bring great good into our world in memory of their loved one. Click on these links to learn their stories. •Sean Martin has tirelessly worked with local officials and schools in Miami Lakes, FL in honor of his son, Shaye, struck by a speeding motorist while walking on the sidewalk in a school zone. Shaye's photo appears on the above banner. •Barbara Foster, along with her State Representative and many friends worked to see "Kyle's Law" through to passage to allow Texas communities to more easily lower their residential speed limits. •Karen Steffan initiated Keep Kids Alive Drive 25 in Waukesha, WI in honor of Ashley - whose photo appears on the banner above. •Natalie DeLeon's mother, Beatriz, daily efforts working with Massachusetts legislators to enact a primary seat belt law in her honor. •The Henry family of Yardville, NJ set up an educational scholarship in honor of Anthony. •The Diffenderfers of Perkiomenville, PA created a butterfly garden for the community in honor of 2 year-old Anna. •The Faust family of Lees Summit, MO doggedly worked to address engineering challenges that factored in to Justin's death. •The Lloyd family of Omaha set up a scholarship fun in honor of Shannon to support one or more classmates upon their graduation from high school in 2012. As we embrace the life we have been given, each of us is challenged each day to live a life worthy of creating a legacy that can benefit others. We can start by paying attention to how our driving behaviors can make all the difference in keeping others, and ourselves, safe on and around roadways of all kinds. Begin today by visiting "Get Started to Keep Kids Alive." 9/8/2011 - America Bikes has issued a statement supporting President Obama’s call for a “clean” extension of SAFETEA-LU. 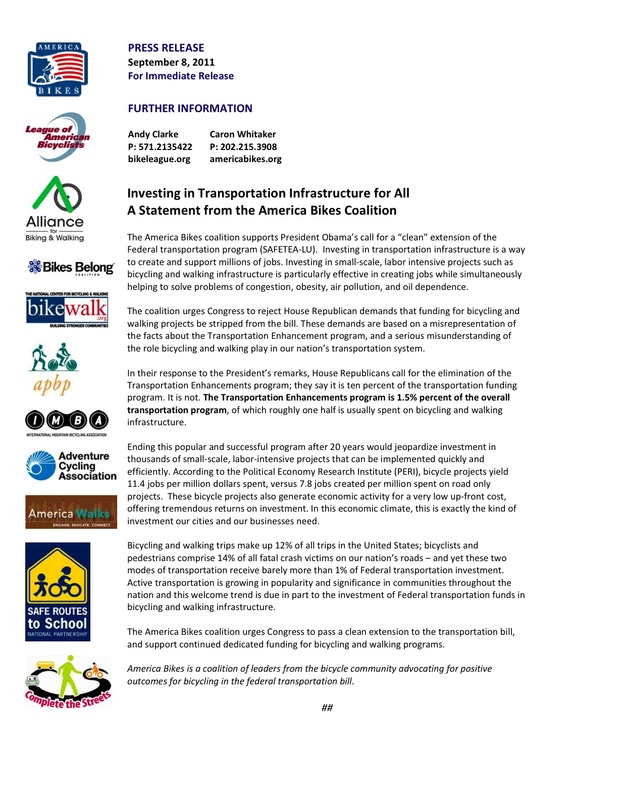 In this statement we also urge Congress to reject House Republicans’ demands that funding for bicycling and walking be stripped from the bill. Read America Bikes' statement right here. National, state and local leaders are called on to support and observe National Childhood Obesity Awareness month this September. Organizations around the United States will plan and carry out activities that build awareness about childhood obesity and encourage action. Individuals will take steps to help reverse the rise of childhood obesity. Every person in the US can be an important part of Childhood Obesity Awareness Month by taking small steps (think walking and bicycling to school!) that add up to a big difference: eating more balanced meals and snacks, engaging in physical activity more regularly and sharing your personal plan and commitment with family and friends of all ages. This toolkit provides information, weblinks and tools to promote and celebrate September as National Childhood Obesity Awareness Month. Use hashtag #childobesity in your tweets this month to join the conversation during National Childhood Obesity Awareness Month. After you have visited this page and explored it's contents, please answer: 1. What is a walking school bus? 2. What do you think a bicycle train is? 3. How might either of these help you to develop active transportation plans for your students? Join us for Green Drinks Reading! WalkBikeBerks will be speaking about Safe Routes To School (SRTS) and International Walk To School Day taking place on October 5th. SRTS promotes children walking and biking safely to and from school. October 5th, Walk To School Day is an international recognized day that promotes and encourages children to walk and bicycle to school on a regular basis. Since childhood obesity is a national epidemic, SRTS focuses on the health benefits as well as not only being good for the environment. The hope is that children will continue walking and biking throughout their lives. We will also discuss: How your school can participate in SRTS as well as WalkBikeBerks assisting schools and parents in this endeavor. We will give examples of Berks County schools that have SRTS programs and events. We will be including the five E’s of SRTS : Education, Encouragement, Enforcement, Engineering, and Evaluation. Cash bar and food will be available for purchase. Join us at Chick-fil-A Exeter for this fun and important back-to-school event! We will join the police and fire departments, who will all offer fun activities and useful information. Plus, enter to win one of four bike helmets! Don't miss it! Win Four Phillies Tickets On Ebay and Build Better Walking and Bicycling! After my post yesterday about the devastating case of Raquel Nelson -- the Atlanta-area woman who was convicted of vehicular homicide after her son was struck by a driver while they were crossing a busy road -- I've been hearing from a lot of readers. Commenter pdxcityscape posted a link to a PBS Blueprint America segment I can't believe I hadn't seen yet. It exposes the dangerous design flaws on another Atlanta-area road, Buford Highway, and explains how outdated, auto-centric planning standards fail to serve an increasingly poor and carless suburban population. The results are often fatal. It's a terrific report. If you care about this stuff, watch the whole thing. Four Days: Phillies Tickets and More! Register now to let us know that you are coming. Click on the Image to See the many different ways others in our nation are completing their streets.